You may think that renting a carpet cleaning machine like Rug Doctor is cheaper than hiring a professional, but you are definitely wrong. There are at least 10 Advantages to hiring a Professional Carpet Cleaning Company in Birmingham, AL. 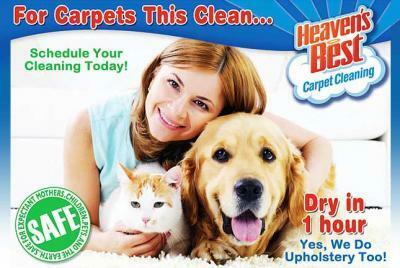 Renting a Rug Doctor will cost you just about as much as hiring Heaven’s Best Carpet Cleaning. We charge $29 per Room for rooms up to 200 Sq. Ft, with a $50 minimum purchase. The Rug Doctor costs approximately $29 – $39 to rent for a day, and that is before you purchase any of the cleaning solutions. You may be thinking that this doesn’t sound too bad, until you look at how much the carpet cleaning solutions cost. They are not cheap! We know because we have a carpet cleaning business. Now, we don’t buy the retail carpet cleaning solutions, but they we checked the prices and they can run you anywhere from $12.99 to $29.99 for a quart of cleaner. And, this doesn’t include spot cleaners. By the time you add in the solutions and spot cleaners, you could be up to $50 -$75 to clean your own carpets and you haven’t even started cleaning yet. Next, you need to ask yourself, “how valuable is my time?” I am guessing if you are like most folks, your time is very valuable and you don’t have enough. Why not save yourself all this hassle and call Heaven’s Best Carpet & Upholstery Cleaning at (205) 618-9150. Our 3 Room Special is only $87 and you don’t have to do any work. 1. Professional equipment/Industrial-strength vacuum power– Heaven’s Best uses equipment and products certified by the Carpet and Rug Institute, which means we use the best technology to get the best results. We also use the best commercial vacuums on the market to ensure we are picking up as much dirt, dust, hair, and other dry contaminants as possible. 2. Environmentally Safe Cleaning Solutions – Heaven’s Best Cleaning Solutions are Environmentally safe. This means that you don’t have to worry if you have allergen sensitivities, or small children, elderly parents or pets in your home. They will not be harmed by our cleaning products. Our solutions are safe for kids, pets, you and your home. 3. Don’t break your back – Another bonus is that Heaven’s Best technicians will move furniture such as couches, chairs and tables before cleaning. No need to break your back or rent a dolly. 4. Improve the air quality in your home – Regular vacuuming will only remove surface dirt and dust, leaving pounds of built-up grime embedded in your carpet fibers. It is recommended that you have your carpets professionally cleaned once a year – more frequently for larger households and areas with high traffic – to remove deeply layered dirt underneath your carpet. Heaven’s Best carpet cleaning equipment is powerful enough to eliminate the unseen dry contaminants, thus improving the air quality inside your home. 5. Save you time – When you clean your carpets yourself, you have to move the furniture, vacuum all of the carpets, spot treat your carpet to remove stains, apply pre-treatment solution to your carpet, fill and empty the tanks, and and clean the equipment and return it when you are done. Phew! Using Heaven’s Best means an experienced technician takes care of all of those tasks for, saving you time and a trip to the chiropractor. 6. Avoid mold and mildew – Mold and mildew are common carpet invaders. Often, they appear after someone attempts to clean their own carpets, and leaves them excessively wet. Heaven’s Best uses a low-moisture carpet cleaning process that will thoroughly clean your carpet without over-wetting them. This means you won’t have to wait days or even hours for your carpets to dry. With our process, your carpet will be dry in about 1 hour. 7. Restore to your carpet to its original beauty and quality – Aside from removing stubborn stains and embedded dirt, Heaven’s Best objective is to restore your carpet to its original beauty and quality, or at least close to it. Maintaining your carpets with regular professional deep cleanings will help you extend the life of your carpet and will leave your carpets feeling and looking fresh and clean. 8. Protection – Heaven’s Best also wants to help you protect your carpets from future stains and accidents. Ask about having specially manufactured cleaning agents such as Scotch guard applied to your carpet to protect the fibers from wear and tear, as well as stains and spills. 9. Knowledge of different carpet types – Heaven’s Best Technicians are all IICRC certified (Institute of Inspection, Cleaning & Restoration Certification). This means they have attended extensive training courses and have passed certification exams indicating they have knowledge of the different types and brands of carpet, and they know how to use the best cleaning methods and products for your carpet. Instead of taking a risk using a carpet cleaning rental or store-bought cleaning solution, protect your carpet from unintentional damage and let a pro expertly clean your carpet. 10. Guaranteed – Heaven’s Best offers a 100% guarantee of our work. If you are not satisfied, give us a call and we will come back for a Free follow up cleaning within 30 days. To take advantage of the 10 Professional Carpet Cleaning Advantages in Birmingham AL, call Heaven’s Best today at (205) 618-9150 to schedule a Carpet Cleaning.